�You�re a niner� is the way Ken Weinstein put it when we greeted him in the press area for the first time this year. I reflected later that it was a good thing that this wasn�t the 8th or 10th year in a row we attended this festival, as �eighter� or �tenner� just don�t seem to have a place in the lexicon. This being said, why wait for the already anticipated 10th year of the nation�s most wide-ranging festival to take a retrospective look on it as a whole? All of us who came the first year were drawn by one of the greatest jam-band line ups of all time. Hippies in hiding since Jerry�s passing crawled out of the woodwork to see what would become of a line-up filled with surviving members of the Grateful Dead, Trey Anastasio, and numerous bands which had been building devoted followings of their own without the aid of the soon to follow slew of similar festivals. We found an extremely well organized 700 acre farm waiting for us considering it was a first year event, and in spite of the horror stories many travelers had of waiting fourteen hours and more in line, the overall vibe generated was certainly one of success. Tickets had been sold out well in advance, and generations of those experienced in the ways of peaceful communing with fellow traveling souls accomplished the task of populating the waiting camp with positive energy and resourcefulness. The second and third years brought some tweaking in the methods of parking and foot traffic control. One of these was a memorable fence intended to separate pedestrians from autos, but this turned out to be a mere linking of cage strands standing in the way of where people were and where they wanted to be for the short period of time it remained standing. Seemingly, the organizers have taken careful enough notes over the years to not attempt to force the horde of music hounds into spaces and traffic patterns which they did not wish to be in. Interestingly this 2010 year seemed to be more riddled with parking and infrastructure complaints than the closest preceding years; but most were probably due to the torrents of rain coupling the earliest arrivals and the ensuing mud and stuck vehicles. At this point, uncooperative weather aside, the settling in of incoming attendees seems to be something both parking staff and campers have reasonable expectations of. So after we had a few years under our belt, we were pretty sure we knew what would be coming as far as the headliners were concerned; some member or members of The Dead, Phish, and Dave Matthews, an icon in the vein of Bob Dylan or Neil Young, and of course, Widespread Panic. The shift to gain more widespread appeal came in the 5th year with Tom Petty and Radiohead as headliners, to be followed in years to come by The Police (ah, it was worth a try), Tool, Pearl Jam, Bruce Springsteen, and other huge names. It looks like it�s not just for hippies anymore, and guess what? It still works! The variety of sounds coming from all the stages continues to be unparalleled. 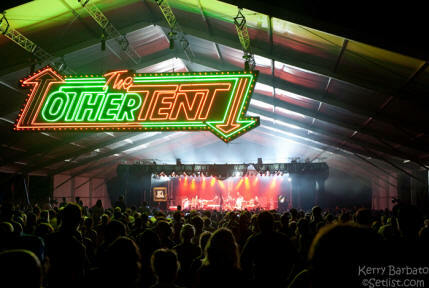 It is a well recognized fact that you will miss more good music than you will see any given year at Bonnaroo, and if you want to delve more into the artists who have graced the stages you should check out the details back at the Setlist.com �Bonnaroo� section. Sure, it hasn�t been nine years of perfection. Traffic problems have been mentioned, Kanye West should never be mentioned, and this year�s newest stage, the Lunar Stage, certainly deserves a mention. Maybe it was a good idea in general; there are plenty of folks tripping around until sunrise so why not provide some super late night entertainment? There is not enough room in the cinema tent to accommodate all the sports fans or Conan fans who would like to see their performances, so why not provide a larger venue for that? Here�s why: the sound from the Lunar Stage was so loud it drew out a steady stream of negative comments from fans trying to enjoy music from The Other Tent, as well as eliciting comment from at least one performer. The volume also penetrated weary bones far out into the campground trying to rest up for the next day�s battle with the elements, for the benefit of the geeking-out among us, far into the wee hours. All in all, it seems the consensus led toward removing or relocating this failed experiment. But hey! Who�s here to focus on the negative? Life is too good and Bonnaroo is too short. We all get to sleep eventually. Speaking of the positive, no trip to our adopted home in Manchester is complete without a visit to Planet Roo, deep in the heart of Centeroo, to see what those kind and conscious people present there are up to. It was no surprise to see a tent dedicated to helping those directly affected by the catastrophe in the Gulf of Mexico, nor a surprise to see the many other familiar names and organizations out there doing their part. A brief trip into Planet Roo never fails to elevate one�s consciousness and inspire us to continue to try and create a better world to live in, and if your timing is right you might even get a refreshing free sample of Ben and Jerry�s newest flavor, �Bonnaroo Buzz�. Talk about elevating your consciousness. If there has to be a point to this writing, it would have to be that it�s all intended to remind you that there are good things going on every June in eastern Tennessee! The music you hear will change your station, the things you do will change your mind, and the people you meet will change your world. Make sure you�re a part of it when we see you next year for the 10th anniversary! This show has an average rating of 4.08 out of 12 votes. This show has an average rating of 4.75 out of 8 votes. Comment: (1) for Steve's birthday. This show has an average rating of 4.89 out of 19 votes. Set 1: Tip Of The Tongue, Simian, Jump Off, Golden Ghost, Bellweather, Behind Midwest Storefronts, Spiritualize, Blacklight Sunflare, Flower Sermon > Crazy Train > Flower Sermon > ?? This show has an average rating of 4.00 out of 13 votes. This show has an average rating of 3.74 out of 38 votes.